Zhu Dequn, formerly named Zhu De. Born in October 24, 1920 in Anhui Xiaoxian town of clay (formerly Jiangsu Xiaoxian, 1955 transferred to Anhui province) although Xiaoxian is located in the corner of Huaibei, but known as Xiuwen learn the art of traditional. The town of clay is surrounded by mountains, Zhu Dequn was often in the forest recreation. His grandfather Zhu Hanshan, father Zhu Yucheng generation practice, is fond of painting and calligraphy, the father often time to paint myself and others, he is also the father of painting, Lin Xi cursive. Home collection of calligraphy and painting works, become his art enlightenment textbook. After primary school, to Xuzhou high school. In 1935 for the National Art Academy of Hangzhou middle school, because at that time has not yet graduated, he borrowed my cousin Zhu Dequn graduation certificate of registration, and has since become the second "Zhu Dequn zhu". From Mr. Zhu Dequn's youth study experience and his overseas struggle, people can feel the artistic master that always firmly maintained the creative purpose. Therefore, people see a once in Mr. Zhu Dequn's artistic journey over the looming figure: Wu Dayu, Doriva, Pierre, Picasso, Michel Zhu Dequn; they are a quite life communication means the part, even Mr Zhu Dequn's painting career reality artistic environment. Then, around the hero Mr. Zhu Dequn, the twentieth Century European painting to a figurative metaphor to come out. 1935 admitted to the national Hangzhou art college. 1949 from Nanjing to Taiwan, Taipei. 1957 to participate in Paris spring salon to Jing Zhao portrait won the silver medal. 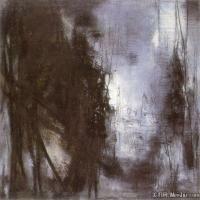 1964 invited to the Pittsburgh Carnegie Museum of modern international exhibition". In 1979 the museum published a book on Zhu Dequn < >, Yu Boruan, (in French literature's nineteenth Century science review authority, poet, writer and art critic). From 1982 1955 to 1982 in the works of Andre Mare, the French Harvard Hou Museum of Contemporary Art exhibition; to participate in the exhibition at the art gallery of Hongkong overseas Chinese famous painting exhibition "in France; Deng Ken Museum of Contemporary Art opening exhibition. The National Museum of history in 1987 sponsored by the Zhu Dequn retrospective exhibition of French modern painting exhibition "; in the same year, the Israeli capital city hall". 1989 art critic Shu Rui qaha jointly planning to promote the "Paris contemporary art exhibition" in Taichung Taiwan Provincial Museum of fine arts, all exhibited works presented in the museum, Zhu Dequn art museum will enrich all software. The advent of the 1993 "Zhu Dequn" album and English French version, by art critic Pierre Cabanne (Pierre Cabanne) ". 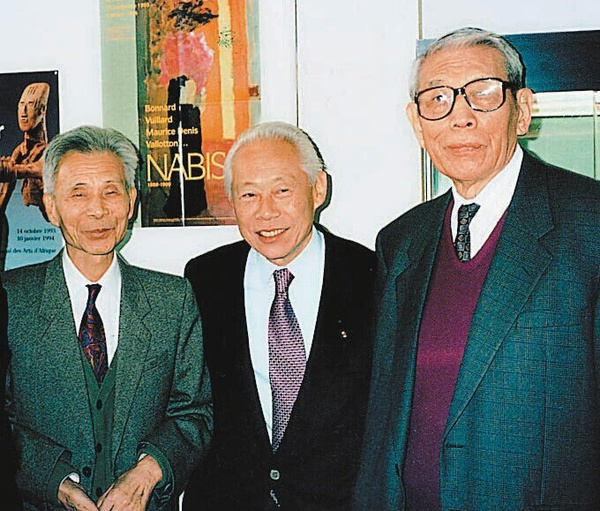 In 1997 the French Ministry of Foreign Affairs Secretary AFAA Zhu Dequn's art activities held exhibition (from 1985 - 1996 works), and exhibited in Beijing, Hongkong, Taiwan tour; College France art academy was elected in December. In 2000 the French cultural center, Shanghai Shou repair Museum, Guangdong Art Museum held a painting exhibition; in Paris IDL lithograph Studio Six lithographs, and art by Hawke Hoke Art global issue. In 1935 to enter the Hangzhou college, then president Lin Fengmian (1900-1991) for art many had studied French snare talent, and Lin Fengmian's painting on French modern preferences, but also affect the art style of painting. The expression of China experience early abstract painting works of Zhu Dequn laid the foundation, make him in just a few years of transition from the concrete to the abstract, very round detached concrete bound, a vast space in the picture abstract structure, also make the abstract nature of Zhu Dequn's paintings magnanimity with deep cultural China. Since 1960s, Zhu Dequn has been separated from the de? Starr El (1914-1955) effect, no longer use segmentation pigment painting knife block surface, focusing on solid lines and color itself, makes the dynamic vividly in front with a smooth brush with strength and speed; after 2000, the artist once again the liberation of visual elements, description and spatial light the shape has become the focus of the picture, night photos "eternal moment" (Lot 1022) showed that Zhu Dequn over forty years of artistic career of different creative characteristics and style. In a self portrait of Zhu Dequn, mentioned the influence Chinese ancient landscape painting of his, in many masters, especially in the wide range of his works show the majestic momentum and vivid style most admire, Zhu Dequn said: Fan Kuan said its division in person, or a teacher; he. Or the teacher in the heart, the so-called division in the heart, that is the painter for the master, and the abstract concept. But the Chinese do not speak the abstract two words. Nature after the painter's thoughts and fusion and refined, which is the artist's imagination, the connotation of culture and personality is revealed in the picture, China painting and abstract painting ideas agree without prior without previous consultation. "The composition of No. 168 (River Mountain View)" almost pure burnt umber, color is very rare in the known works of Zhu Dequn, but also because of this, we are more likely to feel through pure tone implied in the picture Chinese landscape. But at the same time with Oriental Art Zhu Dequn in the art of painting and Western painting of gentle and delicate thick rough, it is a concrete manifestation of the tools and techniques of painting he China cultural background and the integration of their historical heritage and the use of the west. Zhu Dequn has a passion for China poetry, and he continues to draw to poetic expression, and his work with heroic qualities and subtle feeling. 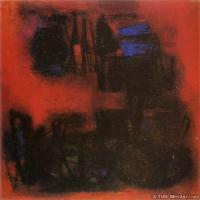 In 1955, Zhu Dequn left Taiwan to Paris, opened his artistic journey. In 60s, he works in a single color as the background, using the pen and pen width fast sway width thickness lines walk on the screen, when there is a waterfall pour water, quite a momentum; The mighty river flows eastward., but the details are in the fine pen outline winding lines, graceful and restrained as the first look to marry joe. The main color of the basic traditional ink painting to ink painting language: Wang Weizhi, Tao, ink on the most. Zhao nature, a creature of the power, then clearly pointed out the importance of Chinese aesthetic system in ink painting, ancient painters have and ink combination as symbols of the basic elements, in the minimum use of color, to create the most profound artistic conception. A change in the characteristics of strong oil viscous under Zhu Dequn's pen, watercolor seemed to combine light flow and ink pen deep, only to change this artist rendering monochromatic paint, create a "black, white, thick, pale, dry and wet six color, and in the seemingly heroic sway. Accurately using simple ink, make the visual structure composed of rich and subtle level, medium and long-term prospects, clear structure, forming a distance and depth of the picture, thus creating a vast expanse of space, and in a size between Fan Zhongyan" Yueyang Tower "in the title of the mountains, swallow the Yangtze River, magnificent, limitless. In Zhu Dequn's recent works, Chinese calligraphy lines become more abstract color combination stack is also more complex, the artist said: the elderly have the most abundant spiritual resources, has a long life experience and memory. I started from 80s, draw my memory, magic swim my memory....... I have to handle memory, memory illusion, like my hometown of wine, the memory as sorghum, then lead to heartburn and burn lung spirits. "The eternal moment" in the river almost the length of the light ribbon like memory, Zhu Dequn little drops of life experience together as a visual element of interwoven, intense strokes such as crack Jingtao shore, sand soft layer gradually like gentle. 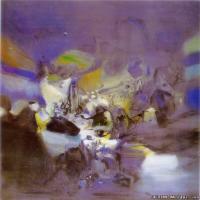 Zhu Dequn's paintings are not purely abstract structure, but corresponding to the nature of the soul, decades of vicissitudes, or sadness or joy, all through the paint flow sway in the picture, his pursuit of two things I forgot, the harmony between man and nature, but also by the artistic creation and implementation. Although the western color theory, the object itself is not the color, the color of our naked eye can see the light from the light irradiation part reflected by the object, to create light color, but in the "eternal moment", Zhu Dequn is rich in transparent and bright and dark color levels derived from light. The light is directional, straight strokes like countless reflection, refraction and reflection of light in space, but also have a guiding role, we like living in a dark cave, turning to the light through the myriads of changes, definition, explore, explore its infinite space. Zhu Dequn make snap delineation of a strong contrast in light of the picture, the shadow of subtle changes in atmosphere from the details, such as Bai Juyi's "Mount Lu cottage notes" said: between light and shade, faint once with spit, Qianbianwanzhuang, not Satan Ji, the dark color is mainly around the upper and lower halves, bring the space effect of depression the color is bright, shrinkage, spread to the edge, to create a sense of open space, transparent dark faint light from the light at the junction of the change and render more artists master the media as clever, real or imaginary, separate the permeable garden space, separation and combination of various landscape elements the formation of space in the East with many twists and turns, and to ensure the orderly changes reduced to fragments, and clear outline of the nature of the artist and abstraction, and the self to say Natural landscape aesthetics is very close to nature. In Zhu Dequn the wanton strokes and lines sway under the guidance of our thoughts are with "the mood in the smoke tree like yunshan. In 70s Zhu Dequn's creation by Rembrandt using color and shading is profound: Rembrandt like white or yellow light type will focus on the thick pen thick dark brown or black background, and the formation of strong contrast and dramatic ups and downs of the picture and create a gloomy and sad atmosphere. Zhu Dequn said: Rembrandt painting light made his paintings more profound and forceful and strong; and in addition to the special style of Rembrandt: strong light and heavy color and broad lines of large touch, Zhu Dequn has always been more personal use fast, similar China "feibai" meaning and collocation of white or other piece of writing light colored blocks, making Zhu Dequn seven 1900's style of painting to get rid of Rembrandt and depressed, but there are elegant and smooth freely flowing style of writing. In 80s, he used the lines, and a thick pen with China calligraphy and painting is very consistent, Chinese calligraphy pitch, pause and aspect can be found in the works of this period. After entering 90s, Zhu Dequn's works are closer to Chinese painting tradition, and the composition of his double and triple is also affected by Chinese traditional hand scroll. And the work of the titles such as "the revival" and "snow melting bling" or "meditation" has Chinese arts tradition focusing on the universe changes and to explore the association between man and nature. Wu Guanzhong once said that "the large strings hummed like rain, the small strings seem like whispers" described in the works of Zhu Dequn, formed by lines of rhythm and rhythm and movement and staggered; combined with the picture of light shading formed such as a note the time when the emergency relief, the ups and downs of the melody line point. Overall Zhu Dequn's works are closely related to natural phenomena, especially with light, and these are impressions of the artist's mind. 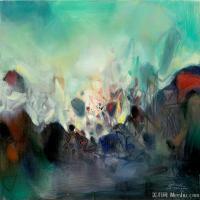 French art critic Pierre Cabanne Bernard once wrote: "true painting comes from memory. " Zhu Dequn is in profound ways, he described the most dazzling on the past. Zhu Dequn shows to the world of love, the world's fragrance, the lingering aroma gas study, those secular troubles, he is to capture the object. 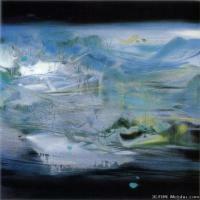 Zhu Dequn to paint nature of the transparent air, cool water, wandering wind, rapid turbulence and early drop ruixue. In the picture often appear pale rosy dawn or a red sunset, the light and mysterious wandering and dancing in them, which is the source of Zhu Dequn works full of vitality. He is in a both exaggerated and lyrical techniques showed a strong and meaningful impression, both dream means and dramatic effect. 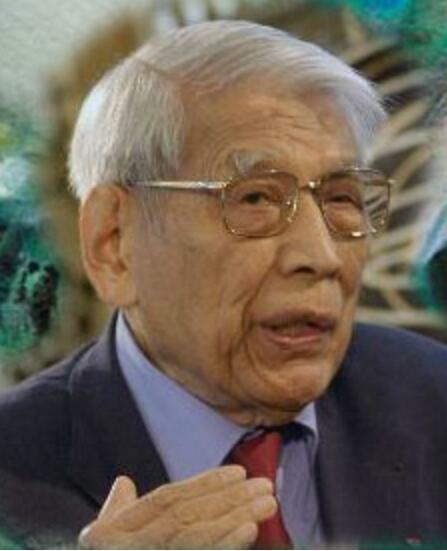 Zhu Dequn graduated with honors in 1941 during the Anti Japanese War, in his alma mater as a teaching assistant. 1944 Nanjing Institute of engineering, Centre College lecturer. 1951 Professor, Department of Arts, Taiwan normal university. These life calendar and experience, so that his "Chinese art and culture chain" constantly advanced and refined. However, he felt at the Hangzhou Academy of fine arts for "western art culture chain is not fully developed. So he resolutely give up in Taiwan has some artistic reputation and academic status, in 1955 by boat Cairo, Spain and other art road came to the world arts Paris. Since then, his "western art culture chain rapidly grow, like" Chinese chain "as high and delicate. This is the "double helix", for infinite combination and mutation, makes him in France and his fame in the world. 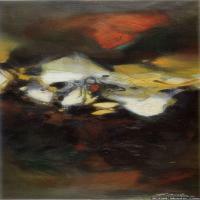 He held more than and 50 solo exhibitions around the world, good reviews. His works are the Paris Art Museum, Taipei Museum of history, the United States, Belgium, Museum of Contemporary Art, St. Louis University of modern art will fund the French National more than and 20 international famous museum. He won art awards many times. His name included "international biography dictionary", "European celebrity", until the name before the lifetime dubbed "College France art fellow" title. Whether his figurative painting or abstract painting, Western critics all say the same thing: Zhu Dequn is painting painted Chinese ink painting spirit of the master, he went deep and picturesque with rich color, the pursuit of profound space and infinite passion and rhyme, as to have won in super. The paintings of Zhu Dequn, when is the artificial speaks "ecological humanism" of the people first. By the French Academy of Sciences, the famous sculptor Abel Filo Zhu Dequn designed specifically for the "French Academy sword" is very special, with a four China hilt of traditional literati to express feelings of Gao Jie Jade -- a piece of white marble, two flat hollow turquoise, also is a carved animal mask of amber in the Warring States period. The sculptor said, made by the western modern stainless steel with ancient oriental colorful jade hilt, is a symbol of Zhu Dequn's painting style, is a symbol of the new connotation of the humanistic spirit. Zhu Dequn is a painter, but his inspiration to people is far more than painting. The relationship between traditional culture and Western culture, people have debated for a century. 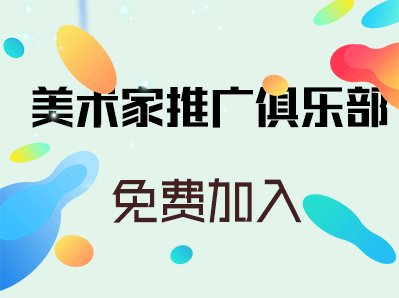 In this regard, Zhu Dequn said: "Westernization" is again good, but just a cultural chain; ambitious "to let China culture led the twenty-first Century world", there is only a cultural chain; why so silly, not to learn the students life wisdom, will be combined into two strands of the double helical infinite mutation it. 2002 summer, accompanied by Zhu Dequn in, personally feel the vibrant new scene of Shanghai, China and the temperament of the international metropolis. China's development and progress, prosperity and prosperity of Shanghai, Zhu Dequn brought tremendous pride and joy. 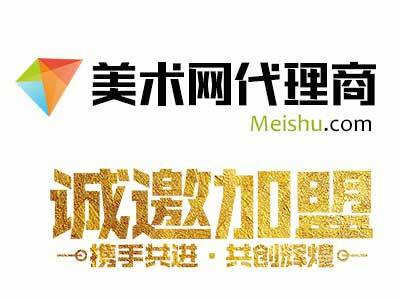 He was on the Shanghai Grand Theater to inspect, accept the offer from Shanghai - Shanghai Grand Theatre "to celebrate the Five Birthday" the creation of a painting masterpiece. He said: I have long for the motherland to leave a painting idea, it can express my mind, I gave it to the Grand Theater, but also to my motherland." This epic effort and talent condenses the life of the elderly. Zhu Dequn created 9 small drafts for it, named "Shanghai Grand Theatre oil painting preparation series" "one" to "the nine", its color from strong to delicate, harmonious, line also from simple to smooth, mature. In order to create a huge oil painting, Zhu Dequn ordered the special paint, can keep 100 years do not fade. Canvas is custom from Russia, weighing more than and 300 kilograms, no seams. He also customized the use of painting electric elevator, every day on the lift platform air operations four or five hours. In order to draw the picture of 4 meter high giant painting, eight year old Zhu Dequn day dragged the body of the elderly, climb up and down in the elevator, often to draw a pen and look down, feeling. So up, very hard. In 8 months, Zhu Dequn step by step the hearts of a dream -- to the motherland to draw a picture of the most beautiful painting. 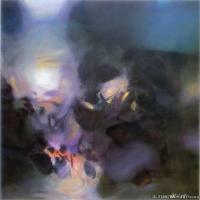 This picture is called "Renaissance artistically" paintings, contains a "Renaissance" theme. Zhu Dequn likes classical music, in the creation of this work he has been listening to Beethoven's "Pastoral Symphony", the natural, lyrical melody to bring inspiration to him. He wanted the paintings to be rhythmic and rhythmic, to be a silent music. Artists think China's past has been an agricultural country, and now is slowly transformation, and he grew up in the countryside, folk landscapes, there are many memories. "Pastoral Symphony" to an idyllic spring busy color feeling, this feeling with his understanding and longing for the rejuvenation of the Chinese are consistent. Zhu Dequn believes that the beauty of nature is like music, without language communication, as long as the heart feel, you can depict the scenery of the heart. In this piece of music of the painting, Zhu Dequn used rich colors and new forms of this theme. A modern artist must be able to withstand the value judgments of different cultural backgrounds. Zhu Dequn lived in Paris for more than twenty years, with a Chinese identity by objective review of local art, the following is the four art critic: Gerald Gassiot-Talabot, Paoul-Jean Moulin, Hubert Juin, York Liersch on the comprehensive review of the quoted what he did. In the most liberal expression of modern art today, Zhu Dequn is loyal to himself, loyal to his race, loyal to the country of his oldest traditions. He had overcome and study volunteers, where be the most changeful creation, Zhu Dequn's personal realm completely decided in a difficult to measure Libra: on the one hand the pack of major pressure of human spirit and artistic heritage, on the other hand is a tempting international painting faction, that for some people, will refuse to belonging to the classification, due to environmental or regional however, fortunately, the painter of his wisdom to avoid these pitfalls because most threatened people, and beyond the Chinese and Western ambiguous zone. His painting is a natural outpouring, trembling, enthusiastic, he does not care about those theorems, rules, visual boundaries, or a variety of signs, his painting is a lyrical dedication. Because he is aware of his knowledge in his painting work in the "original", so it leads to some international research and development. This study is an abstract concept in the lyric (abstraction LYRIQUE), because of its significance relates to the relationship between man and the universe, we can use abbreviated term as abstract landscape painting (Paysagisme Abstract). In fact, in the future, and not a landscape area scenery briefly described, but the scenery in this area as a natural organism, in which one is only a combination, from painting to try to translate his pulse, his blood pressure and some changes with time. Zhu Dequn bold use of rich colors in Western painting, he has a keen sense of the material itself, according to the Chinese traditional painting, calligraphy and painting are very poetic skillfully together, he has the experience of painting, so completely dominate the painting skills. Painting and writing as a gesture, Zhu Dequn deliberately reality and answer the questions in the painting, our eyes can see, there is a direct relationship with the number of the cultural heritage. This time, we will have a inherent scenery, suddenly ejected imagine raw, rushed to us, and took us to disappear in those dreams, in the blink of the abyss, the wind in the open field, memory, retreat melt, leaching into the canvas as color texture. Ramic (Paris art critic) introduces the preface of the painting of Zhu Dequn:...... Perhaps it is the power of fancy in the painting, without question, without control, to stimulate the imagination of the painter, and to enlarge....... In Zhu Dequn's paintings, we experience the adventure, proved this attractive phenomenon, is a mysterious connotation of performance. 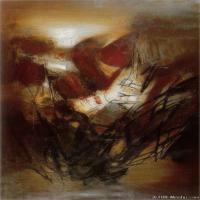 Paris literature and art critic Hubert Juin once said: oil painting, something strong force you to go deep. Is it a speech? Don't say it's a peaceful affair. In general, when a symbol appears, it represents all. Of course, this is extremely illusive, he thought Zhu Dequn's paintings are not demanding "reading", but need "meditation, meditation". Draw out the works, here can not be called a book, in other words is a skill on the details, or the views of some of the viewpoints of cohesion to explain the meaning of a line, a description or a anecdotes. The problem is there is a contrary question: our sight in a moment will be unveiled, to provide run "and so unsmooth throw the helve after the hatchet" the impact of tightening housing. This is his "face", when only the quiet symbol answer, this is the way of communication! Zhu Dequn's painting is not a thing but an entity. 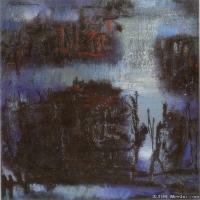 It took him in the field of space, this is real, this shows that Zhu Dequn's painting of the self affirmation: as a entity in a field like, are significant in the current reality, from the beginning of this time, the audience will fall in their own eyes in a considered object the trap, because of Zhu Dequn's paintings have elaborated its self ability so circuitous. Because of the significant reality and urgent designated areas, the works of Zhu Dequn kept constant to, this is his true colors, therefore we in meditation in painting is to find out the answer to communication. Not closed or blocked in Zhu Dequn's paintings of the intention, we can not say that he is to start from somewhere, but can not say that is to stop somewhere there, or the end. He does not start from a certain point to another point, he is a real Avenue (Road), people have such experience, the road is no boundaries. Zhu Dequn's painting is not "image", but he can make people awake, especially can stimulate the people's "image", like a jet kept in the fountain, consistent normal, is endless transformation. The audience does not understand why some people work will pass in front of the moment, this is because he has a picture read, the meaning of it all finished, because these too close in their own content, in the opening of communication is too timid, as long as people come to look it will pale, only repeated voice is repeated, the smaller in there until the silence becomes an empty pretense, this is a strong will of the poet Zhu Dequn really avoid, his painting is not closed. Since 1955, he began painting in Paris, the Paris school and did not give him much influence in his cloud landscape in ancient China thought, China ancient academic performance today to the nuclear age of the universe, there is no one and nothing, is only the two basic elements of endless changes in in the arena, Yang (day) - light, warm, burning, Yin - (to) shade, moist, and Hagel's Dialectics in the form of a "positive" and "negative", so in the same light, between the homologous students of Zhu Dequn's landscape painting to the wisdom of mankind can the capture of heaven and earth "people", he never indulged in India's Elysian Fields. Zhu Dequn with convincing lines never draw to precise character, make the fantasy become a surprise in the pink of perfection, his picture has no perspective western lines, and look at the subject from a distance, appeared several points, overlapping phase replacement, configuration in different plane on the order of. In fact, in the west, the only thing that Zhu Dequn is moved by contrast light and shadows Rembrandt, this is purely from direct observation of nature, with Chinese ink paintings, Jane release, has shown space and light. Some people say that Zhu Dequn's paintings like a shower of brilliance. 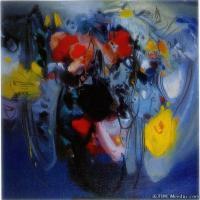 He is full of poetic and lyrical abstract painting, modern painting by the French historian described as "the strong and delicate blend of Western painting Oriental art the most successful artist."